Projects that are no longer current, but you do not wish to delete, can be moved to an Archive folder. View the Archive Projects article to learn how to do this. 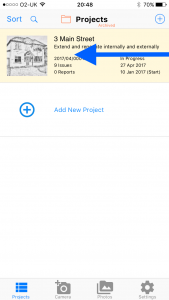 To move an archived project into the Current folder, first select the Archive project folder by clicking Projects (current) at the top to display the folder menu and click Archived Projects. 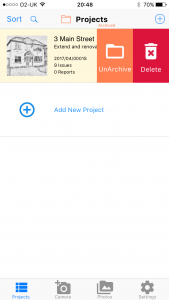 Swipe right to left on the project you want to unarchive to display the menu and click on Unarchive. 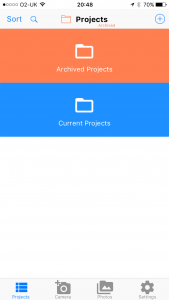 To view the Current folder, click Projects (Archived) at the top to display the folder menu and click Current Projects.